HONOLULU, Mar. 25, 2019 – Employees and retirees of Hawaiian Electric raised $417,633 for Aloha United Way (AUW) during a year-long fundraising campaign to support the nonprofit agency’s mission of building stronger, more resilient communities. Spearheaded by the company’s Power Supply division, the 2018 employee giving campaign was themed “Powered by Aloha” and raised funds through employee and retiree contributions, cookbook and logo merchandise sales, an online auction, and a golf tournament. 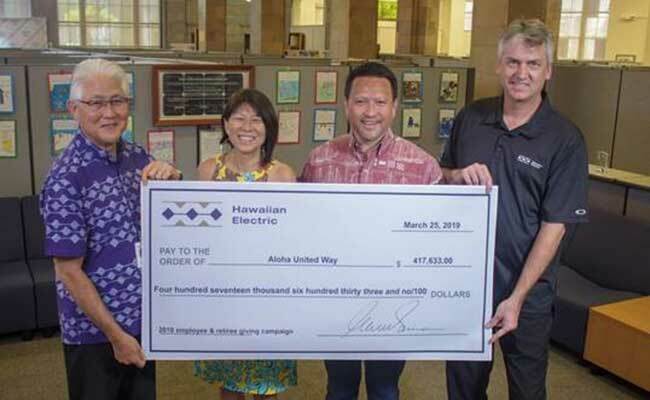 Other creative fundraising activities included a partnership with a pizza restaurant that donated to AUW a portion of sales made by Hawaiian Electric employees on a designated day. ALICE is an acronym for Asset Limited, Income Constrained, Employed. ALICE are our hardworking cashiers, waiters, mechanics and others who comprise 37% of our community and struggle every month to make ends meet. Aloha United Way is celebrating 100 years. The nonprofit agency brings resources, organizations, and businesses together to advance the health, education and financial stability of every person in our community. For more information, visit www.auw.org. For more than 125 years, Hawaiian Electric has provided the energy that has fueled Hawaii’s development from a Hawaiian kingdom to a modern state. Today, Hawaiian Electric is committed to empowering its customers and communities with affordable, reliable, clean energy and achieving a 100 percent renewable energy future for Hawaii. The company is a leading employer with more than 2,100 employees across Oahu.